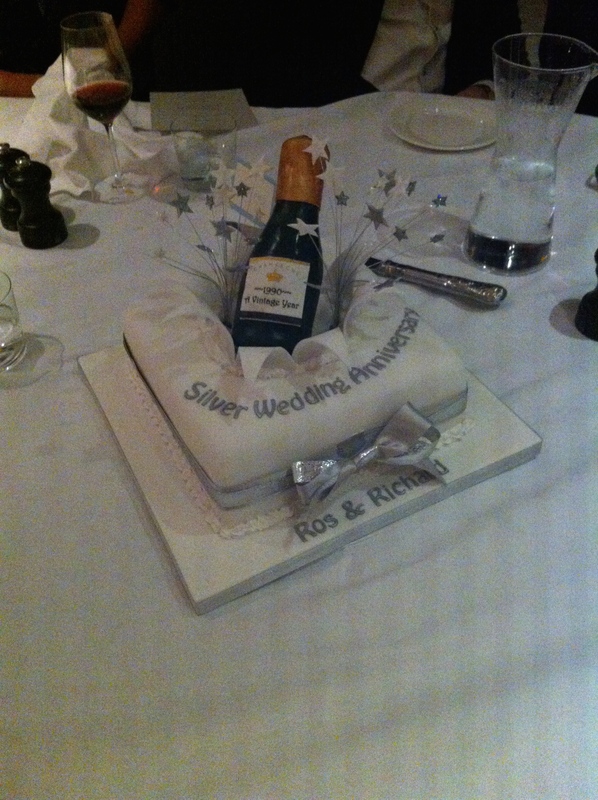 Last night we went to a Silver Wedding anniversary dinner. I still think that kind of thing belongs to my parents generation not ours, despite the fact we are coming up to our 27th. It just sounds so old. So settled. So near death. But then we are old. And I think I am perhaps turning that corner now where actually I see it more as being 25 with thirty years of experience rather than being in my fifties. But I digress. This party was for friends whose wedding we went to all those years ago at the cricket ground in Canterbury. Although I have to be honest and tell you my memory of events is limited. And not because of alcohol, but because I was breastfeeding our middle one at the time who was four months old and hungry. Not being an ‘out and proud’ breastfeeder, and unable to do it discreetly, I spent most of the wedding locked away in a small room with her clamped to my bosom. I missed my father’s speech (which will have been a highlight as he was a fabulous speaker and would have gone to lengths to try to make this one particularly good because it was for the daughter of my Mum’s best friend who had died some ten years previously and her husband only a year later.) However I did catch the groom’s speech which was fantastic. And last night he again stood up to say a few words but this time was heckled by his nearest and dearest throughout. It was a tough crowd last night! We were in a gorgeous hotel in Oxford – the Old Parsonage – all Farrow and Ball, lovely textiles, great service, beautiful paintings everywhere. And we got a free upgrade so even better. Fifteen of us met for champagne and those conversations you have with people you haven’t seen for years and can’t quite remember their children’s names or ages. And the guests of honour were a couple in their eighties – they represented my parents and the brides’ parents as the wife was the final ‘gal’ in the triumvirate of our mothers who had lived together in Chester. And my goodness me they looked so well; nimble in both mind and body. Fantastic. I felt a pang for my parents and wished they were there. We sat in our allocated seating and chose our meals and the wine and conversation flowed. The men moved round between the starter and the mains and we did a quiz about 1990 in pairs. I mention this for one reason only. Yes, you guessed it – the bride’s brother and I won. Whoop! I think it was getting the fact that Glasgow became the City of Culture is what clinched it for us; everyone else put Liverpool. And a flat in Chester sorted. And a smile that lit the sky.